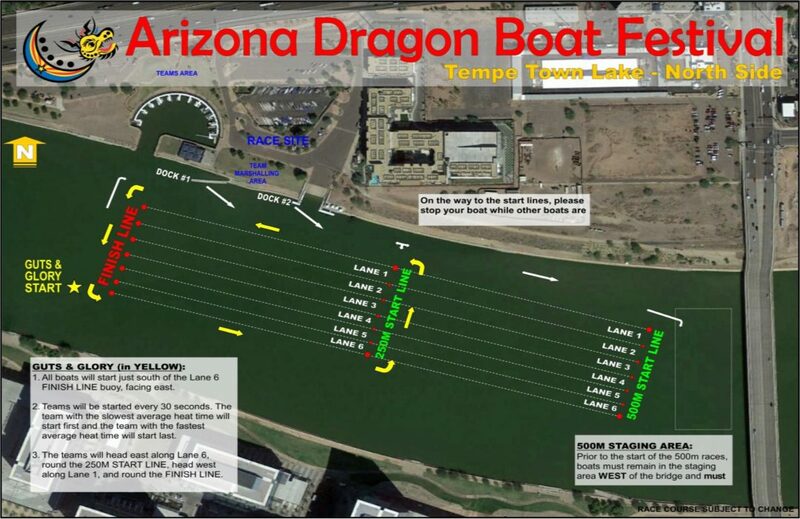 The following are the race rules and regulations for the Arizona Dragon Boat Festival. All Rules and Regulations are based on (a) the International Dragon Boat Federation Members Handbook (2nd Edition, 1/1/1997) and (b) local rules and regulations that apply to the Arizona Dragon Boat festival. All rules are to be read and understood by all teams prior to taking part in the Arizona Dragon Boat Festival. A minimum race crew consists of sixteen (16) paddlers, one (1) drummer and one (1) steersperson. A maximum race crew consists of twenty (20) paddlers, one (1) drummer and one (1) steersperson. All Mixed & Junior Division crews must have a minimum of eight (8) female paddlers and eight (8) male paddlers. All Open Division race crews may contain any amount of male or female crew members. All Corporate, Collegiate and Masters Race crews must have a minimum of eight (8) female paddlers. Crews in Female divisions may race with male drummers or steers, but with no (0) male paddlers. BCS Division crews include breast cancer survivors (female or male) but may also include female cancer survivors. The Youth Division crew consists of youth between the ages of 8-14. The race distance is 250 Meters. The High School Division crew consists of all High School Students paddlers. The College Division crew consists of all College Students. The Junior Division crew consists of paddlers between the ages of 8-18. No age requirement for drummer or steers. All teams are required to have a drummer. Only crew members on a registered team roster will be allowed to paddle with that team. No paddler may paddle with more than one team in the same division. Corporate Division -No paddler in the Mixed, Open, Women or Collegiate or Junior division may paddle in the Corporate Division unless they are an employee or family member of an employee for that team’s Sponsoring Entity without approval from the Chief Race Official. Youth, High School and Collegiate Divisions – No paddler may paddle on more than one of these divisions. Races in these divisions may be run back to back or consecutively depending on the number of teams participating. Teams with paddlers on more than one roster must let the festival organizers know of possible race scheduling conflicts. Festival organizers cannot guarantee that there will be no conflicts in the schedule, especially during the afternoon finals. In case of time conflicts for your races (e.g., back to back races, concurrent races), please notify the officials at the marshaling area before your race. There will be no changing of drummers, steerspersons between continuing heats (back to back races). Please prepare and coordinate for sufficient drummers and steerspersons for all your heats. All team members must sign the event waiver/roster form prior to entering a boat (including practices). No paddler or team representative may approach the Timing Tent or the Start Line Tent. These areas of the race site are out of bounds to all race attendees. Any paddler or team representative that approaches the Timing Tent or Start Line Tent will receive a verbal warning and may be assessed a penalty. When the Start Line Official is in the process of aligning boats for the start of a race any boat heading to the start must stop prior to reaching the Start Line Tent until the race is officially under way. A boat heading to the start of a race that crosses in front of the Start Tent while another race start is in process will receive a verbal warning and may be assessed a penalty. Captains, Coaches and Steers are expected to attend all Captains Meetings held during the race weekend. Teams will be assigned lanes by number, and must line up and stay within these lanes during the start, race and finish. A team will not be considered to finish unless all crew members who started the race are present in the boat. Standard races are 500 meters in length, unless otherwise stipulated. All teams must complete all assigned race heats to be eligible for Awards. Team Captains and Coaches must read and follow the race grid to be on time for races. In order to keep races on schedule, the dock crew will not wait for any teams. Make sure your entire crew is ready to marshal and check in at the loading area. It is your responsibility to check the race grid and be aware if races are running ahead or behind the times posted on the schedule. There will be no changing of drummers, steerspersons between continuing heats (back to back races). Please prepare and coordinate for sufficient drummers and steerspersons for all your heats. When heading to the starting line, stay close to the sea wall as other teams may be racing. Your team must stop paddling 50 meters before the lead racing boat. Restart paddling immediately after the racing boats pass. Boats must listen to the Start Line Official and follow instructions when lining up for the start. Starters instructions will include procedures for boats to ‘hold’, ‘back up’, and ‘one minute to start’ while boats are lining up for the start. Once the Race Start Official determines that the boats are lined up evenly (at his/her sole discretion) in the designated starting area a warning of “We have alignment! Paddlers are you ready?” will be called out. The drummer should raise their hand/drum stick if not ready. There is no guarantee that the starter will wait. A warning signal of “Attention” will cue all paddlers of every competing boat to prepare for the start. The Race Start Official will sound the start signal at any time after the warning signal. Drummers may not drum during Start procedures. Drummers must stop drumming if the Starter calls a False Start. False Starts will be signaled by three sound signals after the start signal. A boat changing lanes during a heat may not pass in front of any team on the course. A penalty or disqualifications will be assessed at the time of race completion. Any contact between boats may result in penalty or disqualification. All boats must attempt to avoid contact at all times on the water. A boat which is not competing must keep clear of all boats which are competing. When heading to the start of the race, boats must stop to prevent wakes when any race is in progress. The Finish line will be at a fixed point between the North and South shore. Buoys on the finish line will indicate the position of the finishing line but are not the official line. For the Finish Line Officials to stop the clock, the Dragon Boat’s bow (Dragon’s nose) must cross the finish line. All boats must finish the race in their assigned lanes with all team members including paddlers, drummers and steers in the boat. Upon finishing a race, each team must promptly return back to the launching dock without causing delay for the next heat. A penalty may be imposed to the boat causing the delay. Check for clearance, then turn towards shore in a long, gentle, under-power turn and head back to docks as quickly and safely as possible. Follow loading official’s commands to return the boat to a specific location. When returning, WAIT for boats leaving the loading area as they have the right of way. Not following the official’s commands may also result in penalties. Crew members that are inebriated or under the influence of any drugs or drink will be disqualified from racing. The Organizing Committee has the sole discretion to deny any racer from entering a boat who they feel has been drinking or using banned substances. All Life Vests must be fully zipped up and properly buckled from the time the paddler enters the marshalling area to when the paddler leaves it. These life jackets MUST be kept on until all team members have returned to the marshalling area after their race heat. All life jackets must be Coast Guard and DOT approved. Inflatable Life Vests will not be permitted. All clothing must be worn under PFDs for easy visual confirmation of proper PFD usage. All AZDBA life jackets and paddles must be returned and must not leave the marshaling area after each race. Penalties will be applied to offending parties in the form of added seconds to their race time. Any Team determined to have broken a rule, as defined in these Rules and Regulations, or any team not complying with safety protocols may receive a time penalty or disqualification, depending on the seriousness of incident. Mixed Division Teams with less than 8 female or 8 male paddlers in a Race crew will be assessed a penalty of 30 seconds. Corporate, Collegiate and Masters Teams with less than 8 female paddlers in a Race crew will be assessed a penalty of 30 seconds. Any alteration or damage to festival equipment may result in a penalty to be assessed by race officials. Any switching positions or teams, standing, rocking or leaving the boat once the boat has left the dock may result in a penalty. Discipline – The Chief Race Official shall be responsible for implementing the Disciplinary Code and additionally may penalize any crew or competitor who behaves improperly or shows contempt by bad conduct or speech towards the Race Officials or any other persons, including on-lookers. All roster changes on the day of the event must be approved by the Festival Team Coordinator. Disqualified teams will not be allowed to compete for awards in that set of races. A Cox box with speaker and/or a stroke coach will be the only electronic devices allowed on the boat. Any other electronic items and/or any noise-making devices or GPS devices are prohibited unless approved by the Chief Race Official. A team must not cross in front of the Start Tent while the Starter is aligning or starting the boats. If a race start is in process the approaching team must stop and hold their boat before reaching the start tent until the race is underway. Appeals must be made by the team Captain or Manager only. All protests must be made in writing to the Volunteer Tent within 15 minutes of the conclusion of the race heat in which the penalty was assessed. The Chief Race Official will investigate the written appeal and discuss appeal with other Race officials. The Chief Race Official will make the final ruling. The ruling of the Chief Race Official is final and without appeal. 250m Racing Course shall be of a circulatory nature having two straight sections and three turns in one circuit of the Course. The turns shall be marked with 2 buoys, one (1) at the apex of each turn and one (1) at each turn to indicate the curve of each turn. The turn buoys/flags will mark the start and finish of each turn. The 250m racing course will have 6 turns. Racing shall take place in a counter-clockwise direction. 1. Crews will race approximately 1500 to 2000m on the 250m course with 6 turns. 2. Crews will race counter clockwise, starting at the Finish Line facing East. 3. Teams will start at 15 to 30 second intervals according to their 500m rankings from Saturday, seeded slowest to fastest. 4. The Starter will be on the Race Official boat on the water at the Start Line (Finish Line) or be stationed on land at the Start Line (500m East Finish Line) and will use an air horn for the interval starts. 5. When a boat is overtaking another boat in a race, it is the duty of the overtaking boat to give clear water (2m) to the boat it is overtaking. Similarly, the boat being overtaken is not allowed to alter its course to impede the overtaking boat or boats. Failure to provide right of way will result in a penalty. 6. A boat can overtake another boat on either side as long as the overtaking boat maintains 2m clear water from the boat being overtaken, no boat contact will be tolerated and immediate disqualification of the negligent crew may result if there is boat contact. 7. Overtaking in a turn: if a boat covers another boat at the right of way buoy/flag, that is, any part of the overtaking boat shadows the boat ahead with any part of the overtaking boat, that boat will have the right of way through the turn. The race referees will identify and call out which team has right of way approximately 20 meters before each turn to avoid confusion. Teams must abide by the referee decision. When two crews are negotiating a turn together, it is the responsibility of both crews to Steer in a manner that is unlikely to cause a collision and avoid a collision with another boat. 8. When more than two crews are making a turn, at the same Turning Point, then all crews must hold their lines going around the turns, a crew on an outside line must leave room for a crew in the middle and the middle crew must leave room for a crew on the inside line; to follow the line of the turning point buoys in safety, that is, at least 2m clear water between the paddles in adjacent boats must be maintained around the turn. A crew on an inside line must not make difficulties for a crew holding an outside line by, for example, steering wide around the Turning Point. If in the opinion of the Race Referee, a crew has not attempted to steer in a safe manner around a turn, then Time Penalties may be awarded against the offending crew(s). 9. If a boat has the right of way but takes a wide turn, then they forfeit their right of way. 10. It is forbidden to purposely slow down or obstruct a fellow competitor. A penalty may be awarded for actions of this nature or the team disqualified. 11. Safety shall be the single most important guiding principle when racing Guts & Glory. All steers persons are to avoid contact and collisions at all costs, even if the fault lies with the other crew. Failure to do so may result in the immediate disqualification of the negligent crew. 12. A crew missing a buoy on the turn will be accessed a time penalty and if done consistently (that is, more than twice) may be disqualified. 250m Racing Course shall be used. Boats will complete the course up to 3 times before the winner is determined. In the first round all participating boats will race the course after which the slowest boat(s) will be eliminated “Knocked Out”. The remaining boats will immediately proceed to the start line and complete the race course a second time. Again the slowest boat(s) will be eliminated “Knocked Out”. The remaining boats will immediately proceed to the start line and compete one final time to determine the winner of the race. Adjustments to race course, times, race schedule and cancellation of race heats may occur due to a number of circumstances including weather, daylight, water conditions, safety, etc. These adjustments are a part of the event and are at the sole discretion of the Race Officials and are final, without appeal and without refund. Click here to DOWNLOAD the PDF copy of the 2019 AZDBA Race Rules.